Nous avons fini notre séjour d'Aout 2015, à la Villa Sepalika avec nos 3 enfants de 12, 15 et 17ans. Emerveillement dès l'ouverture du Portail, avec un Parc magnifiquement arboré, une très belle et grande piscine, devant une maison à l'inspiration coloniale, où tous les détails sont très déco. La décoration soignée dans le choix des matériaux, des couleurs et des objets sont un régal pour les yeux. Le personnel est adorable, et a été à l'écoute de toutes nos demandes. Bandara, le manager, a eu un soucis permanent de rendre notre séjour le plus agréable possible avec beaucoup d'attentions vis à vis de nos ados, devançant leurs appétits féroces! Les diners pris dans la salle à manger ont été des découvertes chaque soir, avec le meilleur Rice & Curry de notre séjour ! Bref un endroit parfait..., où nous reviendrons ! 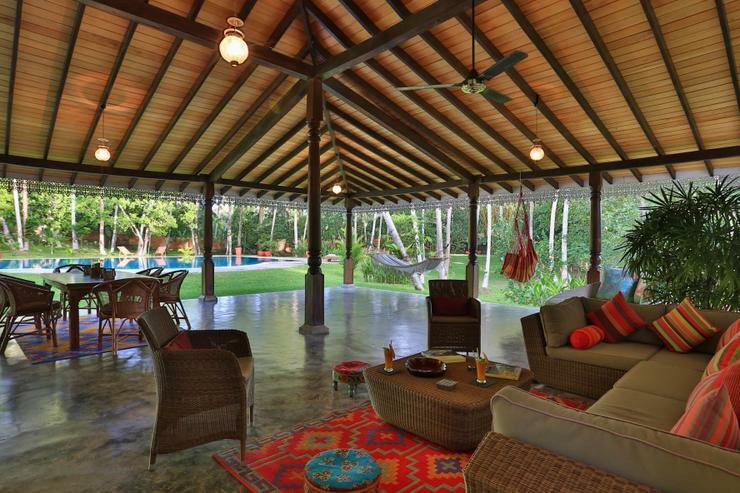 The photographs and description do not begin to do justice to this fantastic villa. The living space, bedrooms, bathrooms, courtyard, veranda and pool are all exquisitely laid out, generous and beautifully interior designed. The house is an absolute delight. Full of antique features integrated into an elegant new build, with lovely touches, stylish decoration throughout, and artistic displays of fresh tropical flowers. 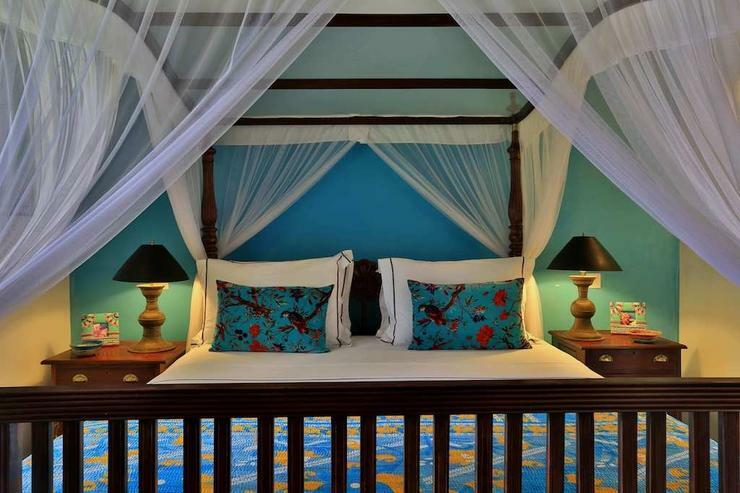 The four poster beds have comfortable thick mattresses and linen sheets. 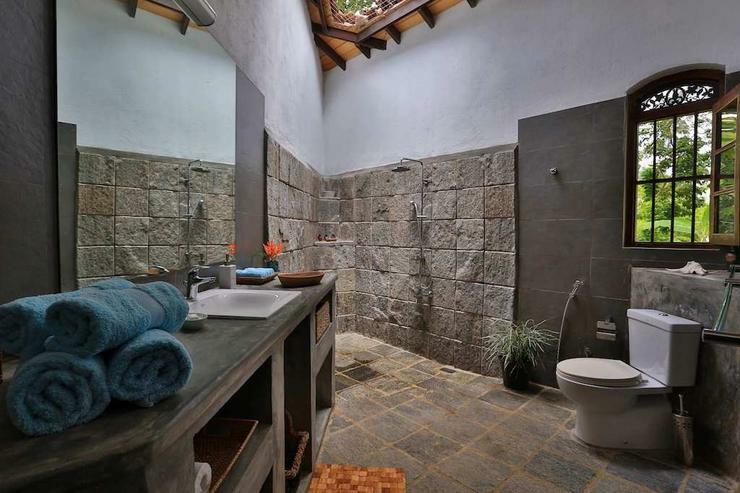 The bathrooms have open roofs over the showers, so when it rains you can literally enjoy a genuine tropical rain shower. 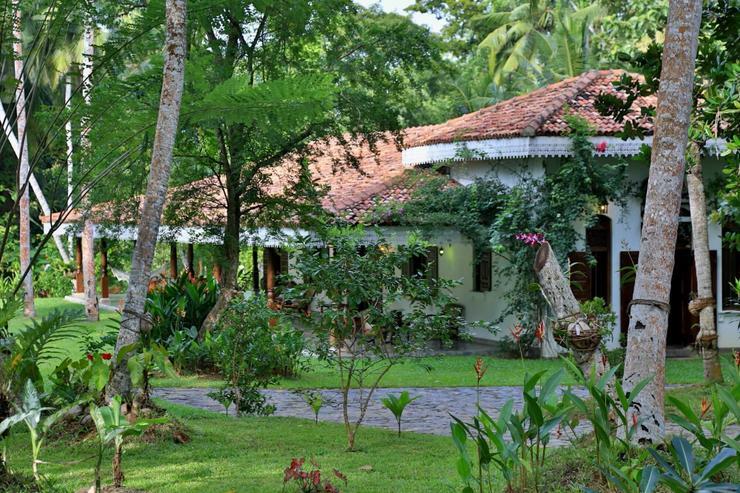 But it is the management of the villa by Mr Bandara, the wonderful chef, the house-keeper, gardeners, security man that makes this place so special. You could not meet a kinder, nicer more dedicated team. 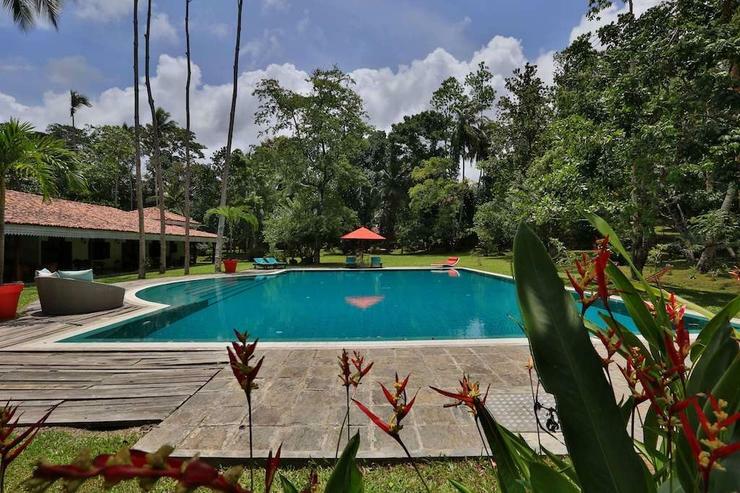 The whole garden which is visited by wild peacocks and the occasional monkey is raked every morning, with every leaf collected, and the pool cleaned. Then there's the food. Which is superb, beyond what you might expect even at a French owned villa - there's a menu of ideas you can chose from at very reasonable prices - I think our food bill worked out at a bit less that £20 per person per day for breakfast lunch and dinner. We enjoyed a great cookery demo. 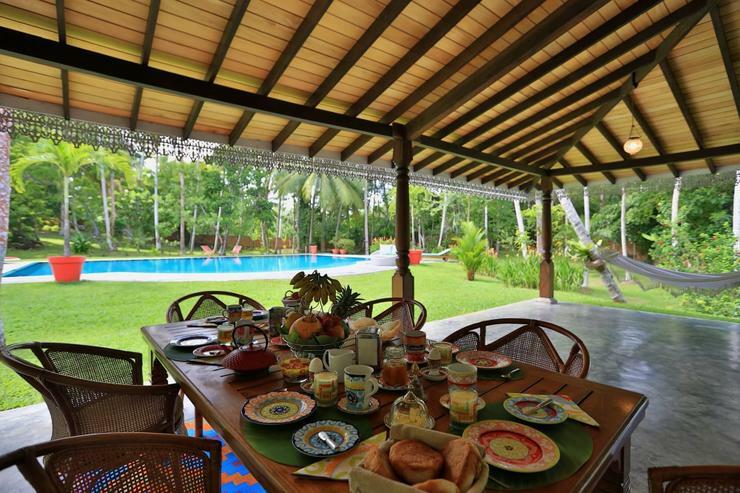 This is real luxury, the discrete with excellent service, an enormous pool and beautiful garden. 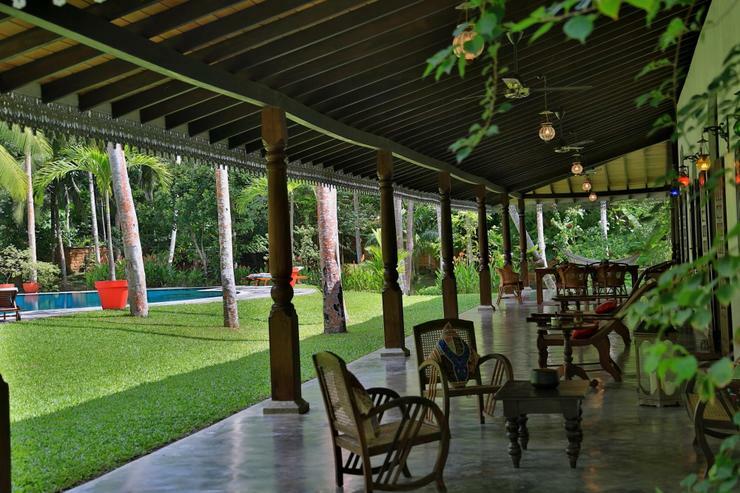 Staying at Sepalika is an absolute treat, and highly recommended. To go to Galle takes about 15 minutes in a tuktuk, costing approx Rs1000. Various beaches are a short drive down the road. There are interesting temples nearby. The Villa itself is up a short track close to the Ginigala junction which tuktuk drivers and locals seem to know how to find. One word of warning - we taught Bandara how to play racing demon but by the fifth game he was beating all of us. When we got there at night our driver did not know the location and we were a bit apprehensive. However once we got into the compound and saw the house we were all relieved. 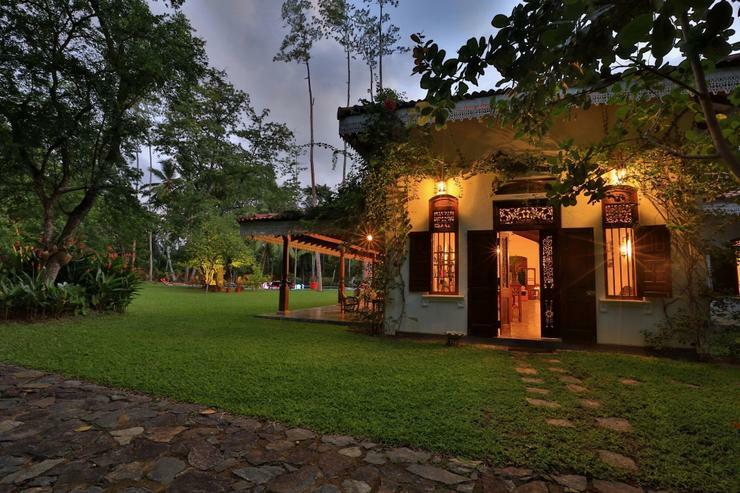 It is a Colonial style house kept in excellent condition. 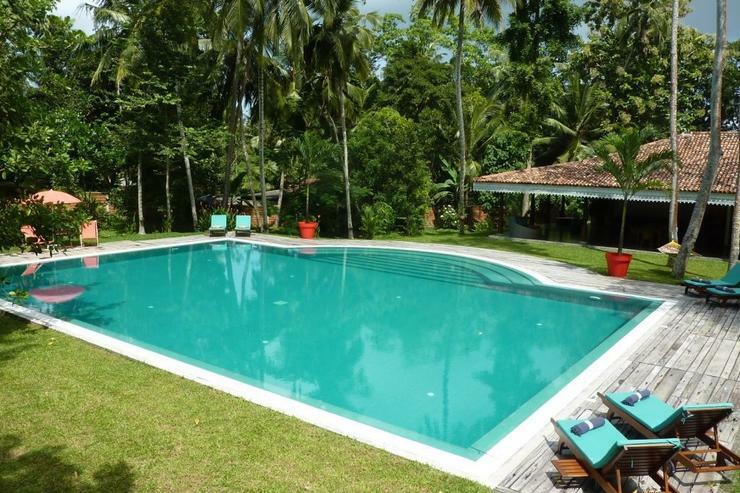 The place is clean, with spacious bathrooms and an excellent swimming pool. They have many toys and games available for children. 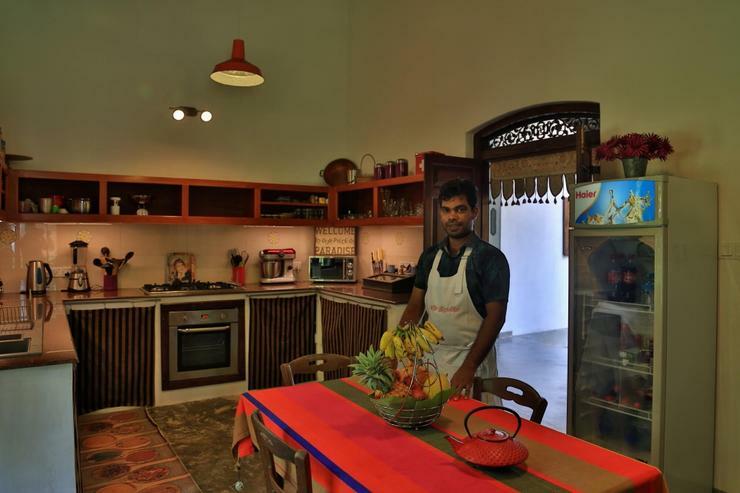 The hosts were also very nice and made good Sri Lankan food. 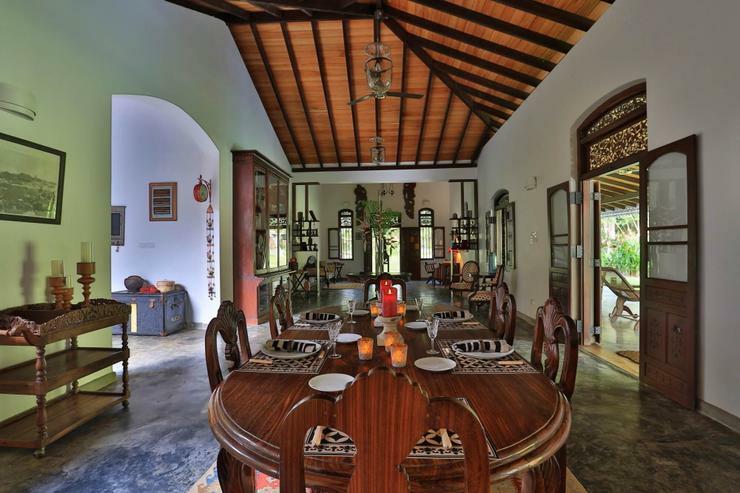 Villa Sepalika is located in the village of Ginigala, 5 miles South of Galle on the South-West coast of Sri-Lanka, barely 2 hours driving time from Bandaranaike International Airport. - All money paid is forfeited but credited for 9 months from the date of reception of the cancellation. - The credit value can be used by the client or anyone on his behalf during any period, subject to availability and solely for the Property initially booked. - All money received will be forfeited. Peak Season: All funds received will be forfeited or refund in pro-rate should Aptenex Ltd. or the Manager/Owner source a replacement booking. Failure for the guest to pay the balance in time, modification of booking period and early departure is deemed a cancellation and cancellation charges will be payable unless otherwise agreed in writing. 1.A deposit of thirty percent (30%) of the total rental amount including service charge and taxes, if applicable, must be paid by the client within 5 days working days after reception of the invoice sent by Aptenex Ltd. to confirm the Booking. The furniture and decoration items are a mixture of genuine antiques found in the area and modern furniture purchased in interior design shops in Colombo or coming from Europe. We particularly brought our attention to the decoration so one finds a harmonious and comfortable setting. 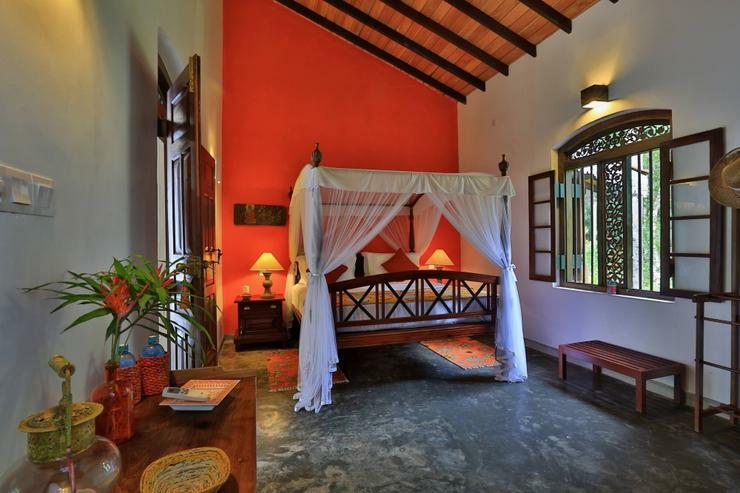 All three air-conditioned luxury rooms open on the inner yellow coloured wall courtyard. 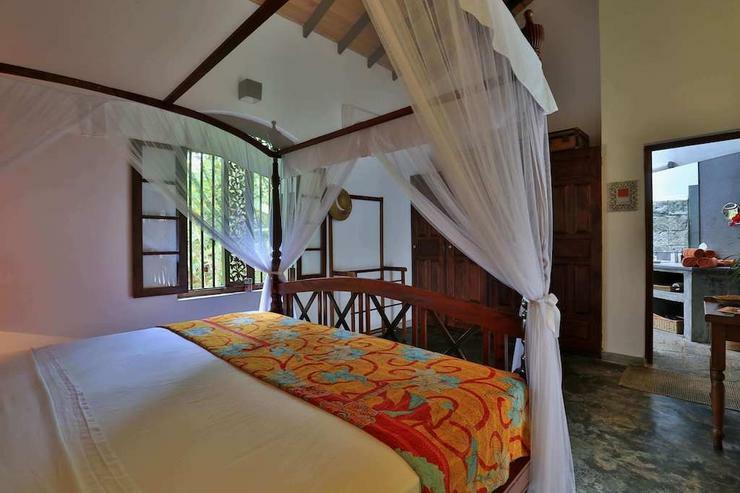 Four-poster beds (180x200cm) come with mosquito nets. Bed sheets are of excellent quality as well as household linen( french made 100% cotton and mixture of cotton and linen). Each room has a vast wardrobe with shelves. 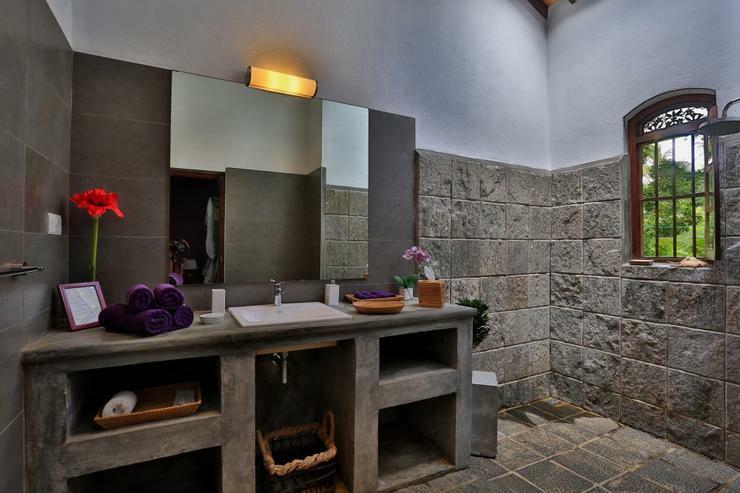 Each one has an en-suite bathroom with open concept showers. Materials used are a mixture of granite and cement cut. Bathrooms come with shower gel, shampoo, body lotion and a hairdryer is available. Master bedroom. It is the largest of all three rooms (193 sq.ft. / 18 m2) with its adjacent bathroom (140ft2 / 13m2). The windows open to the side of the house with view on parts of the park. The orange colour is a reminder of Buddhist monks clothing and brings a peace of mind feeling. Junior suite (172ft2 / 16m2) with its adjacent bathroom (140 sq.ft. / 13m2). Window opens to the back of the house. The blue colour is a symbol of wisdom in India as Krishna’s body is painted in blue. Junior suite (172ft2 / 16m2) with its adjacent bathroom (108 sq.ft./10m2). 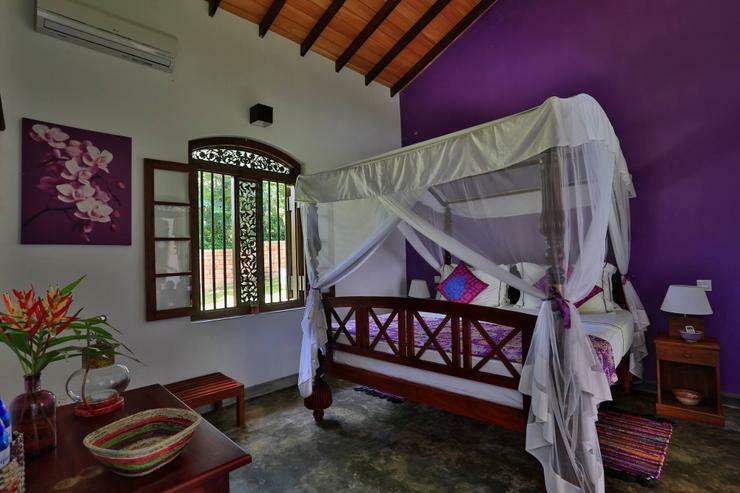 The window also opens to the back of the villa.In Hinduism, purple is a powerful and mystical colour protecting man. This is the Villa’s main space since it measures 1000sq.ft. (95m2). Actually, all the different spaces are in a row. The living room both gives onto the long veranda, the square veranda and the courtyard. 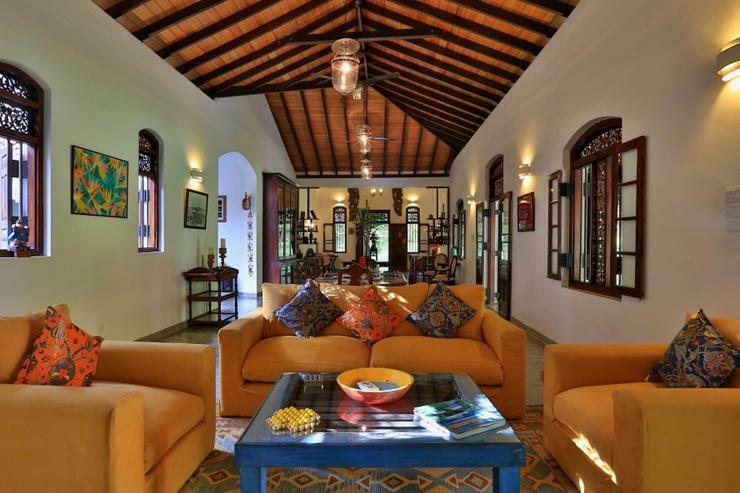 We paid great attention to the interior design ( typical genuine antiques from Sri Lanka). The main entrance door, as well as every window and door, are antique items. Wood carving is particularly fine. A five heads Ganesh statue welcomes you in the lobby. Ganesh in Hinduism is one of the most sacred gods. He is also a household protective god. As you arrive at the villa, feel free to sit on the long sofa and enjoy our cordial drink. Meals will take place at the large table if you wish. At dinner time, you may enjoy the view of the long veranda enlightened by warm coloured glass lanterns. If you like, after supper, you may enjoy a nice TV program or DVD ( original version or French version). The Safran colour of the couch and the blue coffee table bring a more contemporary touch to the lobby. 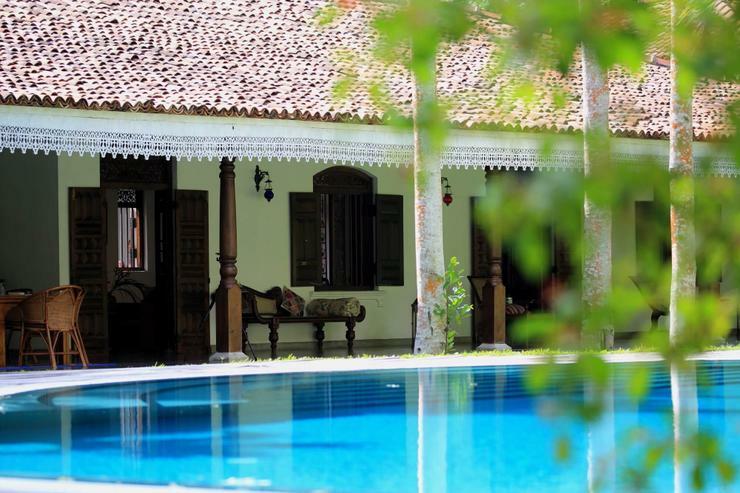 The courtyard is a typical architectural element of a colonial house since it’s located in the centre of the villa. The central part of the courtyard is not covered by the roof. Rooms and kitchen access is through the courtyard. Our idea was to give a more modern look to this central area. Three small windows put the living room and the swimming pool from a perspective point of view. Relaxing, napping on the couch or reading in the arranged corner, these are the courtyard’s activities! The land is 9600 sq.yd. 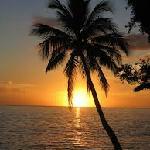 (8000m2) and is a true enchantment day or night. You may sit down around the well, on a bench along the stonewall or lay down under the bamboo copse, walk anywhere you like, the garden is yours. Doing so, you may discover a large variety of birds, squirrels, peacocks, monkeys. 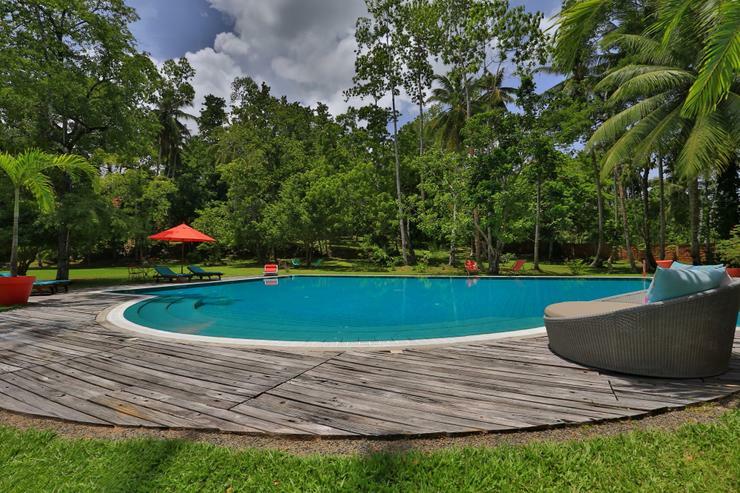 Bathe in our huge infinity pool (52ft x 33ft), a few steps away from the veranda. It is a permanent call for bathing or simply lounge by the poolside on sun loungers with a book or drink of your choice. Pool depth is 5 ft with its flat bottom. Water temperature is between 30° and 32° all year long. You might as well enjoy a delicious midnight bath thanks to our cool lighting. An outside freshwater shower is placed at the foot of the pool. 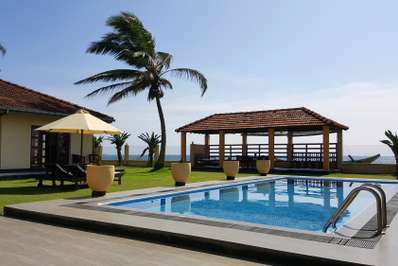 Six sun loungers with mattresses and pool towels are arranged around the pool according to your wishes. Pool floats and games are also available. Of course, the pool is daily cleaned and checked by Palitah, our gardener and pool maintenance man. 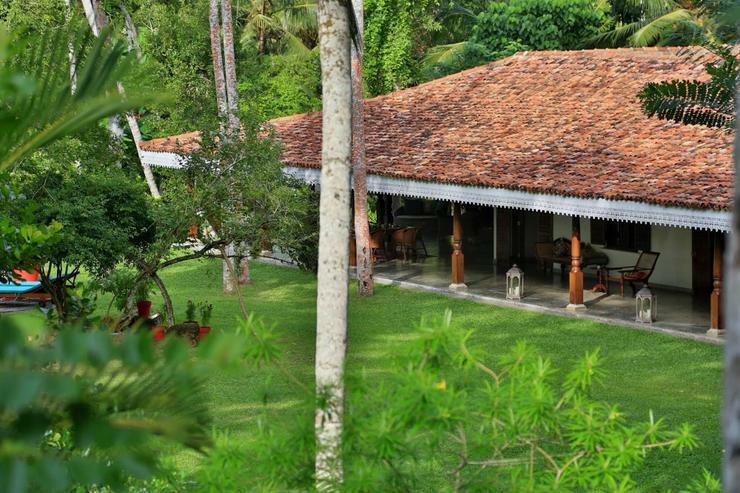 Located in Hikkaduwa, Galle and surroundings. The Old Lady at the Sea is a in Sri Lanka. 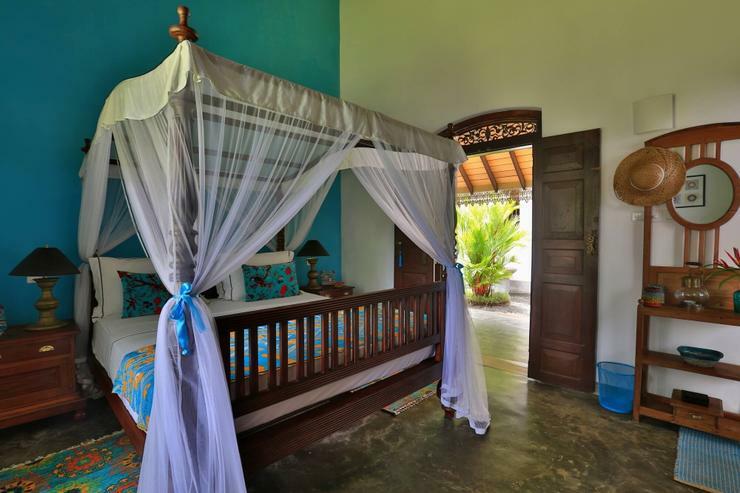 Located in Hikkaduwa, Galle and surroundings. 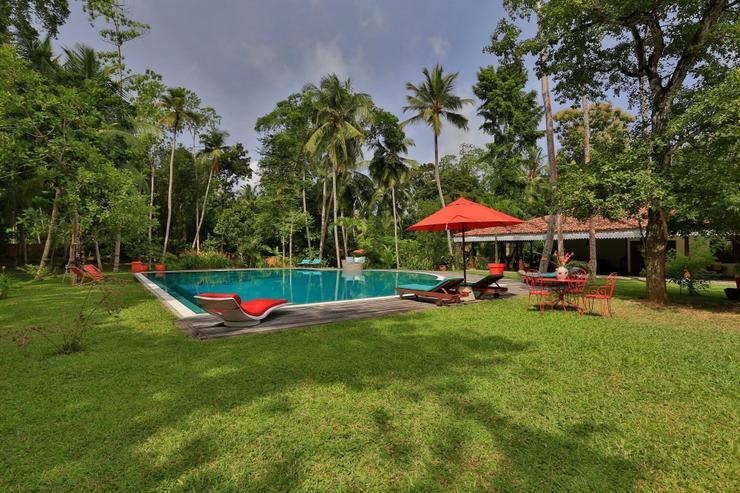 Taru Villas - 906 is a in Sri Lanka. 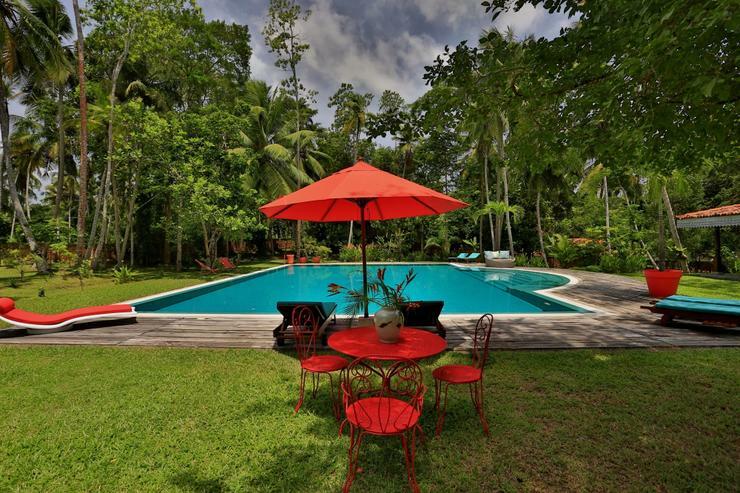 Located in Hikkaduwa, Galle and surroundings. Hikkaduwa is a in Sri Lanka.